Development of the new edition of Heavy Gear was started in 2012 with the goal of making the game faster and easier to play. The damage system has been overhauled removing calculation that slowed the game down. This has resulted in a more dynamic game with a wider variety of weapon effects and tactical options. Model point values have been rescaled and the entire army construction system has been rebuilt. A developer’s blog and YouTube channel with Heavy Gear Videos has been launched to expand on the new concepts, discuss the process of development and improve communication between players and Dream Pod 9. Now, after more than six months of the alpha playtest with three major rules updates in that time all the changes and lists have been consolidated into the Beta Rules. These rules have their official release at Gen Con 2014 and are available in paper and free PDF formats. 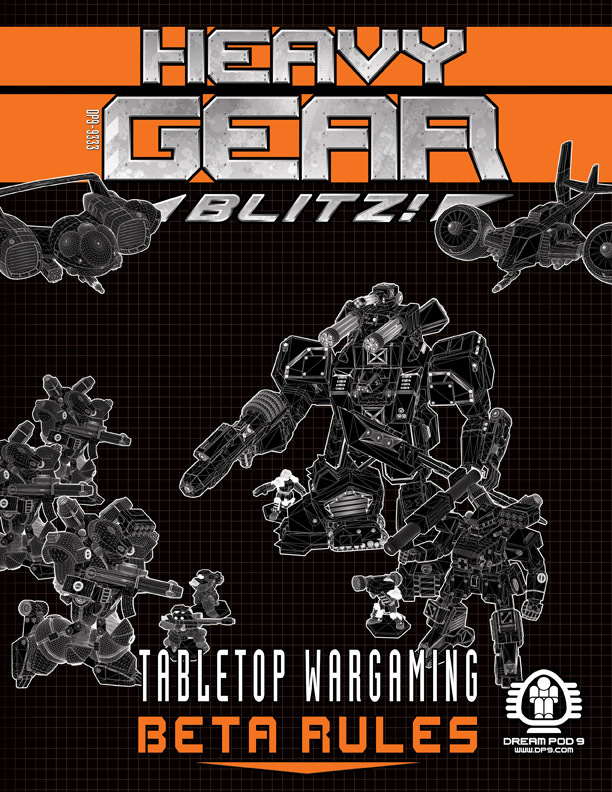 These Beta Rules will form the official organized play rules for Heavy Gear Blitz until the final release of the New Edition Heavy Gear Blitz Tabletop Wargaming Core Rules at Gen Con in 2015 ready for the 20th anniversary of Heavy Gear. The core rules are complete now and our efforts are focused on balancing model point values and specialist army list options. To do this we need as many playtest responses as we can get from you, the players. Big or small, we want to see your army lists and hear about your game experiences. Details of sending in your feedback are found inside the book. We are committed to maintaining an open dialogue with our fans because in the end this is a game for you. Choose your side, get your Gear, and join up! - New rules system, with streamlined combat resolution for faster game-play!- New army construction system with new support unit options available to combat groups. - New Veteran and Duelist options for your armies. - All the faction armies in one book: North, South, Peace River, NuCoal, Leagueless, Black Talon, CEF, Caprice, Utopia, and Eden. Plus Faction Sub-Lists for the WPF, UMF, NLC, SR, MD, HA, ESE, PAK, and many more. - Listing of all Faction Models with all the stats you need to play. A Kickstarter is planned for Fall 2014, to fund the 200+ page Full Color Core Rulebook, announcements will be made on the Dream Pod 9 Website, Forum and Facebook page as the date draws near. We’ll need all the Players and Fans support to spread the word and make it a successful campaign and bring new Players into the game. For best PDF viewing use of Adobe Acrobat 9 and above are suggested. Here is a direct link to the ebook ordering page for everyone to download and check it out. Plus a link to printed book ordering page of the Dream Pod 9 Online Store if want to pickup a copy of the small b&w format printed book.